Make this a Christmas to remember by sending your best holiday wishes in a large old-fashioned sleigh overflowing with unique keepsakes. When it comes to exciting Christmas gift baskets, this one tops the list. 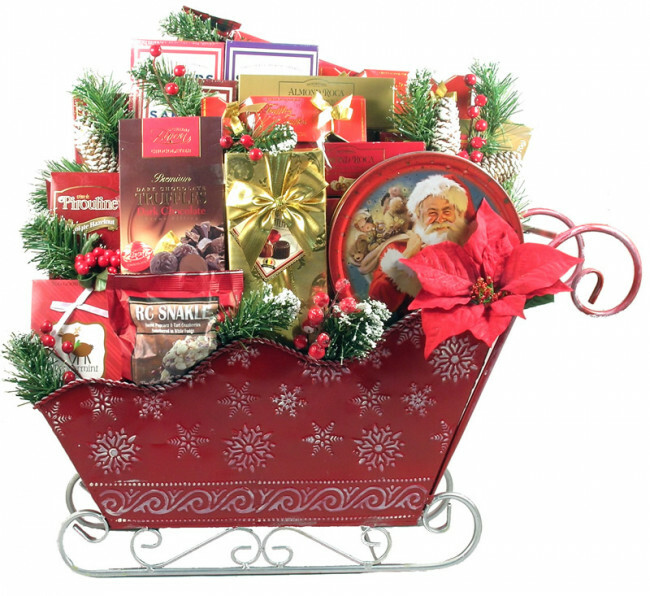 Standing two feet tall and over two feet wide, this GORGEOUS metal sleigh gift will take their breath away! They will surely be fighting over who gets to keep the sleigh. They will be delighted as they discover all of the amazing treats tucked inside. All is artfully arranged in a hand-painted, old-fashioned, embossed metal, keepsake sleigh, decorated with holiday picks and designer bow!